Stay near the sea in the centre of Bodø. Experience the midnight sun, northern lights and world-class nature experiences. Enjoy our large breakfast buffet in our restaurant Bris. A perfect hotel for meetings, only minutes away from the airport. Experience the midnight sun, northern lights and world-class nature experiences. 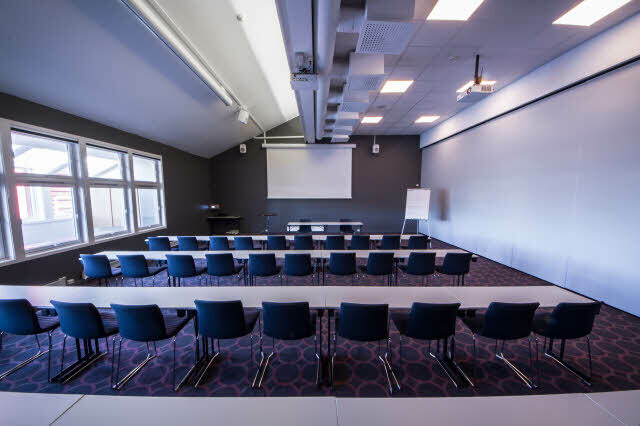 With a flexible meeting capacity of up to 220 participants, we offer a great conference area ideal for exhibitions, receptions, lunch and dinner. Restaurant Bris serves a large, organic breakfast buffet, as well as lunch daily. Dinner only on request. We have a parking garage for guests arriving by car. When you stay with us, you have access to free WiFi in your hotel room and in the public areas. Bodø is located north of the Arctic Circle and is famous for its beautiful nature full of contrasts. Here you can experience the midnight sun, northern lights, world-class nature experiences, and exciting activities. Our hotel is located just 5 minutes away from Bodø airport, and both the harbour and train station are within walking distance. Our central location and proximity to public transport and the airport are ideal for anyone travelling or organising meetings.